Sometimes, being a big shot, starts with looking like a big shot and nothings says, "I made it in life," like sitting by a fire, puffing on a cigar. Of course, smoking a freshly rolled cigar just isn't for everyone, for good reason. There is the smoke, the exorbitantly high tobacco prices, and of course, the health risks, so we thought offering you a better option, would be a win-win. That's why we have an alternative for those who just want that look, but none of the baggage. This Plastic Cigar looks like the real thing, but doesn't come with any of the other drawbacks. 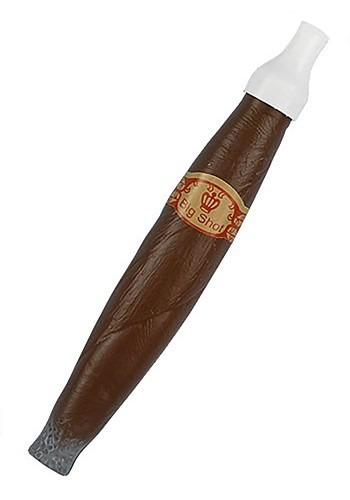 This faux cigar is shaped out of brown plastic, and textured to add authenticity. It has a “Big Shot” sticker on the side and is 9 inches long. Pair it with your gangster costume or any other of your choosing, sit back, and relax.